"Clifton and Clifton Channel, Oregon"
Click image to enlarge Remains of fishing industry, Clifton, Oregon. The top of the old Clifton Cannery building is just visible in the background. Image taken September 22, 2012. 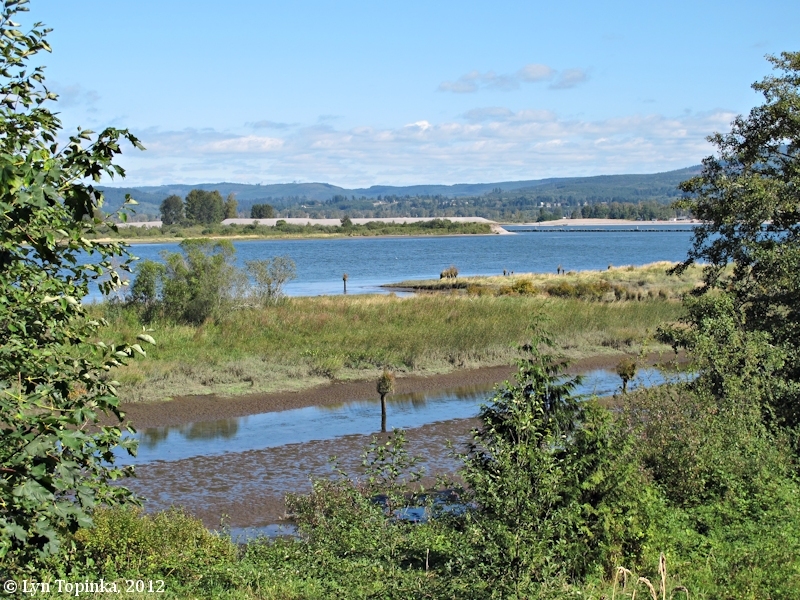 Clifton and nearby Bradwood, Oregon, are two communities from a bye-gone era and are located approximately at Columbia River Miles (RM) 36 and 38 respectively. In the late 1800s Clifton was once a thriving fishing community and cannery location. Bradwood, located on Hunt Creek, was a booming lumber town. Downstream is Aldrich Point and upstream is the community of Wauna. Tenasillahe Island lies across the Clifton Channel from Clifton and Tenasillahe and Puget Island can be seen from Bradwood. Clifton Channel is the southern reach of the Columbia River, separating Tenasillahe Island from the Oregon shore. The main channel of the Columbia is on the north side of Tenasillahe Island. 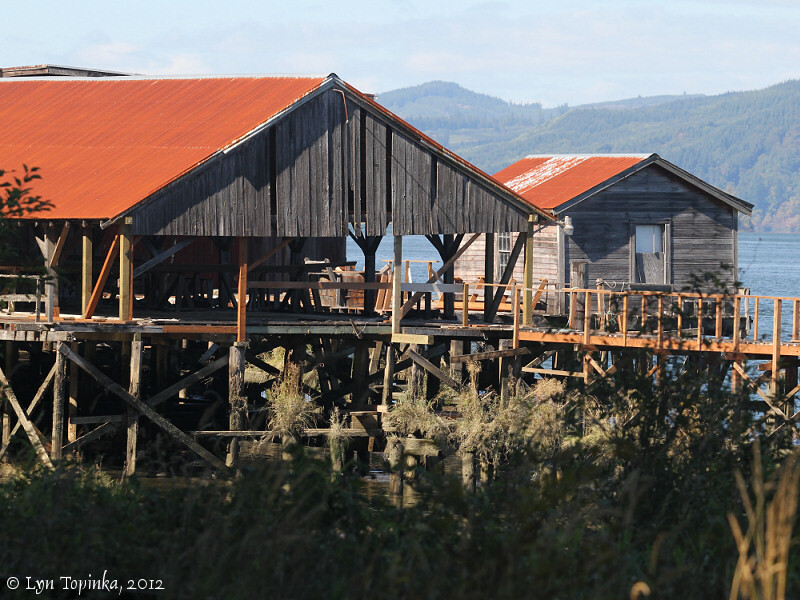 The second cannery in Clatsop County was built in 1873 by the Cook brothers in Clifton, Oregon. "Clifton was a settlement on the south bank of the Columbia River long before the railroad was built, and at one time J.W. 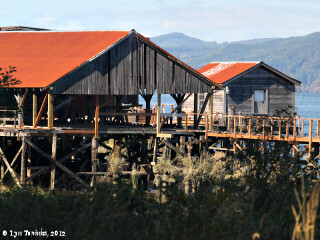 and V. Cook, pioneer salmon packers, had a cannery there. The name is descriptive of the cliffs above the river. Clifton post office was established January 6, 1874. J.H. Middleton, who was living near Waldport in 1927 and who went to Clifton in the fall of 1873, told the compiler that Clifton was the name of the farm of Stephen G. Spear and that he was of the opinion that Spear named the place Clifton before the property came into the possession of V. and J.W. Cook. Members of the Cook family are also of the belief that Spear named the place before the Cooks became established there." 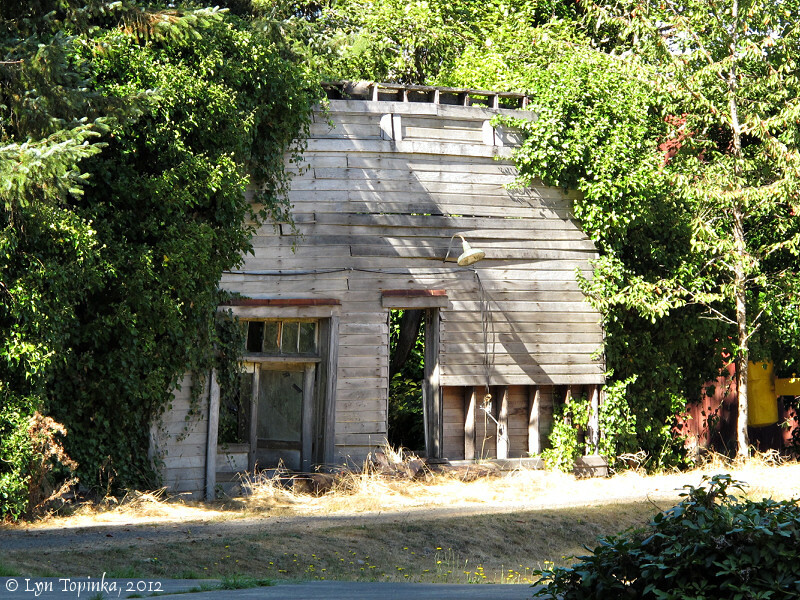 Click image to enlarge Remains of store, Clifton, Oregon. According to Ralph Friedman in "In Search of Western Oregon", Clifton had two stores, one of which closed in 1950 and was "a strew of splinters" (1990, p.124), and the other closed in 1960 and for a while became an office for the Clifton caretaker, owned at the time by Bumble Bee. Presumably, this image is of the remains of that store. Image taken September 22, 2012. 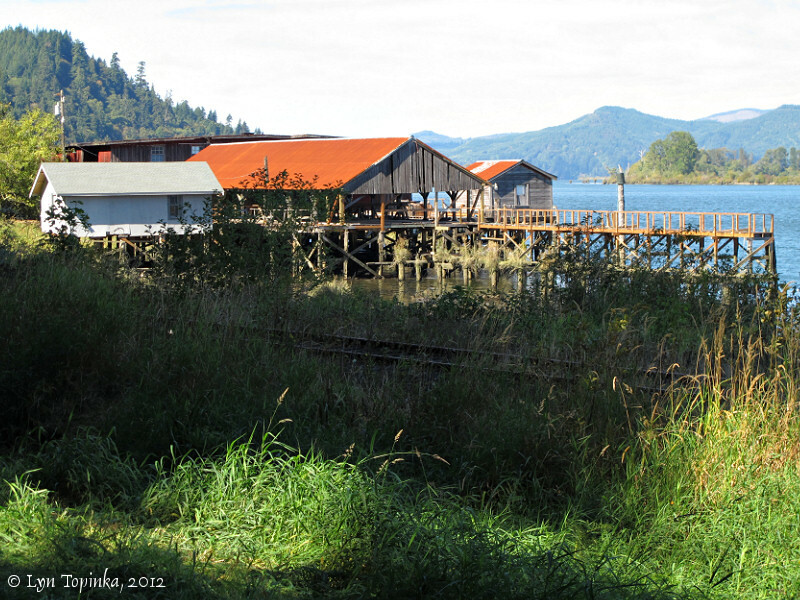 Click image to enlarge Docks, Clifton, Oregon. Image taken September 22, 2012. 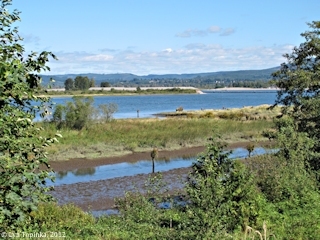 Click image to enlarge Columbia River as seen from the Clifton Road, Oregon. In the distance Tenasillahe Island is to the left and Puget Island is to the right. The settlements of Clifton would be left (downstream) and Bradwood would be right (upstream). Clifton Channel is in the middleground, left. Jetty visible on right juts off Tenasillahe Island. Image taken September 22, 2012.